As the Universal Declaration of Human Rights(link is external) marks its 70th year, UNESCO is launching a digital campaign on the #RightToEducation, a right that is at the core of its global mission to ensure equal access to quality education. Through a series of videos, animations, visuals, interviews and stories, the UNESCO campaign – running from 15 October to 18 December 2018 – will unpack the legal significance of the right to education and the major challenges that are blocking its path. 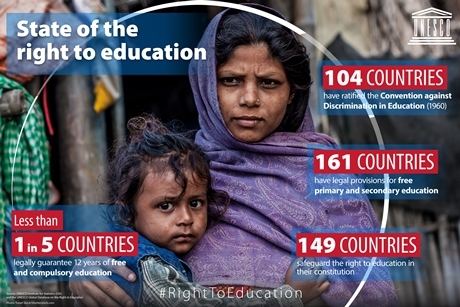 The #RightToEducation campaign aims to bring global awareness of this crucial human right, which is still not a reality for millions, and empower young people and adults to bring about change in their communities. This campaign page contains all essential information and will be updated weekly with fresh content. Stay tuned.